Another one of the new things that I have been trying out recently, has been painting on MDF boards. Unlike painting on canvas there is no spring, which takes a little getting used to. I've also found that depending on what primer you use, you can establish how easily the paint can be applied to the surface. 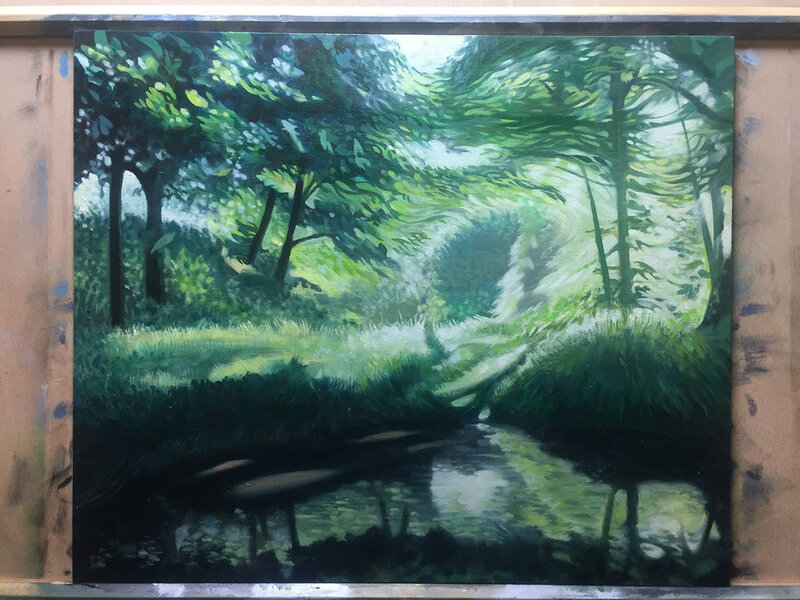 Using an Alkyd primer (in several coats) provides a lovely smooth surface ideal for fine detail, especially when you give it a light sand once it's dry. Whereas using Gesso creates a texture more akin to sandpaper (although this can be sanded down too to give a smoother finish). I have also tried creating a canvas board with these 12"x10"s. I cut a rectangle of canvas that was 2" larger than the board itself and then stuck it to the front of the board, using PVC glue (obviously this was wrapped round the back too and stuck down. I left it to dry for 24 hours and then came back to it to give it several coats of primer. I have tried canvas boards before but didn't get with them because I found that as the oil dried it would warp the panel. Sadly, this was the same case for these boards. So from now on I just stick to working on the plain primed boards. I've tried a lot of different brushes over the years, searching for a brand and series of brushes that best communicate my expression. I have finally got my creative mits on the illusive DAS 1180 Series. 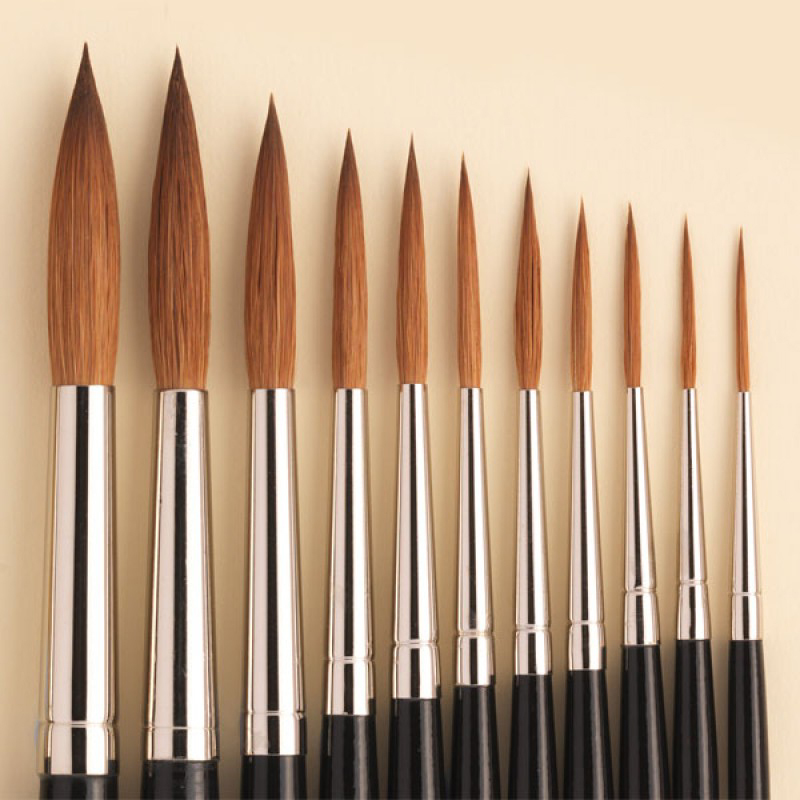 These are the brushes that the New Zealand artist John Crump uses and which I've been trying to find a distributor based in the UK or Europe for yonks! Every type of brush has character and a purpose and are expressed through the combination of the brush's shape, material, length and weight. I have found the 1180 series to be surprisingly enjoyable brushes to use. They don't have the finesse of some of the other brands that I use, but they brim with personality! Even though I had to order them from New Zealand, I wouldn't hesistate in the event of having to orser some more. PAINTING KIT: Wooden palettes - Information & advice. Artist palettes are great and essential bits of kit. I've tried out a few other variations of material and shape, but the wooden ones are clearly my favourite. I enjoyed using the Bob Ross transparent acrylic palette, but found after a month or so of use, it would crack and die within weeks. This happened twice, so I haven't bothered using them again. A glass palette is an option that I have yet to try, but it's on the list and once I've tried it it I'll review it and let you know my impressions. I have had my current palette for over twenty years and had never given much thought to its balance or comfort until I ordered and tried the Expressionist Confidant Wood Palette. Unbelieveable! So comfortable, loads of space and made me realise how uncomfortable my old palette was. I can't recomend it enough. I came across this video and thought I would share it with you as it has a few bits of good info on palettes and show off the Expressionist Confidant Wood Palette.